This whisky has been aged in Bourbon casks and finished in Predo Ximénez Sherry casks and new wood casks. It develops the typical richness of Glenmorangie, with a mellow texture and rich notes of Sherry and spices. Glenmorangie Duthac is an original expression born in 1843 in the heart of the Royal Burgh of Tain, in County Ross-Shire, North of Scotland. 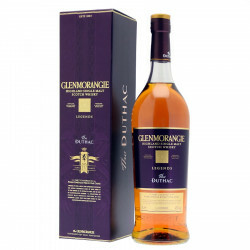 This whisky is a tribute to St Duthac, patron of Tain. His exceptional work gathered many pilgrims on his shrine during the Middle-Ages. "A whisky fit for a King": this expression, visible on the Single Malt's case, honours the annual pilgrimage made by King James IV to the shrine of St Duthac in Tain, and is part of the country legends that surrounds the Glenmorangie distillery. Nose: flavours of pear, candy apple, caramelised Brazil nuts with a spicy backdrop and a hint of roasted oak. A drop of water reveals a creamy vanilla caramel with a linseed oil scent typical of Sherry casks. Palate: a whisky that coats the mouth with milk chocolate aromas, caramel and Brazilian nuts with a touch of anise. The spicy notes are delicate, clean with a ginger and clove finish. Finale: typical of Glenmorangie, with vanilla notes and evocative of creamy apricot and marzipan.